The photographer Annie Leibovitz is best known for her magazine shoots of actors, rock stars, models, politicians, and other luminaries appearing on the covers of old-line vanguard publications such as Rolling Stone, Vanity Fair and Vogue. Her many photographic successes long ago vaulted her into the same exclusive club occupied by many of her subjects — celebrityhood. In more recent years, however, Ms. Leibovitz’s life experiences have sent her veering off in dramatically different directions. Rebounding from that controversial publication, the deaths of family members and her partner Sontag, as well as her own personal bankruptcy — all of which severely tested her — Annie Leibovitz began a long-distance pilgrimage, of sorts. Along the way she traveled to many destinations on a photo assignment for no one other than herself. As she embarked on that journey an objective came into focus: to visually capture the power of, and stories behind, historic objects and locations which resonated with her — something more akin to her September 2001 images of Ground Zero, but executed in a far more up-close and personal fashion. At times she found herself moved to tears by objects which once belonged to dynamically creative and larger-than-life figures whom she reveres (including women such as Georgia O’Keefe, Marian Anderson, Virginia Woolf, Emily Dickinson, and Louisa May Alcott). Her favorite and most compelling photographs of objects from her travels hither and yon were placed in a book she aptly titled Pilgrimage (2011), the text to which she wrote with the help of Sharon DeLano. Scenes taken in places such as Gettysburg, which Leibovitz first visited as a child, also are represented. The book has spawned several exhibitions of the photographs appearing on its pages, including at several institutions known less for their works of art than their displays of historically compelling objects and images, such as the Gettysburg National Military Park Museum and Visitor Center. Presently, the Abraham Lincoln Presidential Library and Museum in Springfield, IL is hosting an “Annie Leibovitz: Pilgrimage” exhibition through August 31, 2014. So how exactly did photographing anything other than living people “save” Annie Leibovitz and in what way did this open up new worlds to her? Leibovitz’s several interviews explain how she came to the realization that an inert object with a storyline or context connecting it to an inspirational historical figure can metaphorically “speak” to us, the living, on a very personal level. She also concluded that it was possible to photograph those objects in a way that would allow others to form their own powerful connections to them and the famous people to whom they once belonged. One object which Ms. Leibovitz was drawn to photograph and feature on two pages of Pilgrimage merits special mention. Unlike nearly all of the other objects photographed for that book, Leibovitz was not attracted to it because of who once owned it or physically handled it. Her picture of this unique object is compelling on several levels, not the least of which is that it verges on qualifying as the product of a celebrity photo shoot. In a virtual sense, Ms. Leibovitz pointed her cutting-edge digital camera directly at the visage of Abraham Lincoln. Although space-time continuum barriers sadly prevented her from photographing Lincoln in the flesh, she still managed to gain access to the National Archives to photograph what may be an original wet-plate glass negative[iii] of four images of Lincoln created when he was seated in front of a multi-lens camera operated by Anthony Berger on February 9, 1864 in Mathew Brady’s Washington, D.C. photographic gallery. To view Leibovitz’s photograph of the Lincoln plate appearing in Pilgrimage, click here. [iv] Photographing this negative offered Annie Leibovitz the closest experience to “being there” with one of the most influential American figures of all time and a man who enjoys an exalted position in the pantheon of our most famous celebrities. At first blush, the four side-by-side negative images of Lincoln (backlit on a photo tray) are eerily ghost-like in appearance. The glass plate images might even remind some of the handiwork of William Mumler, a Boston and New York-based photographer from the mid-19th century who created expensive studio portrait photos into which he inserted apparitional figures made to resemble deceased loved ones. Mumler claimed to be able to photograph spirits which magically appeared around his paying customers in the midst of a studio session. 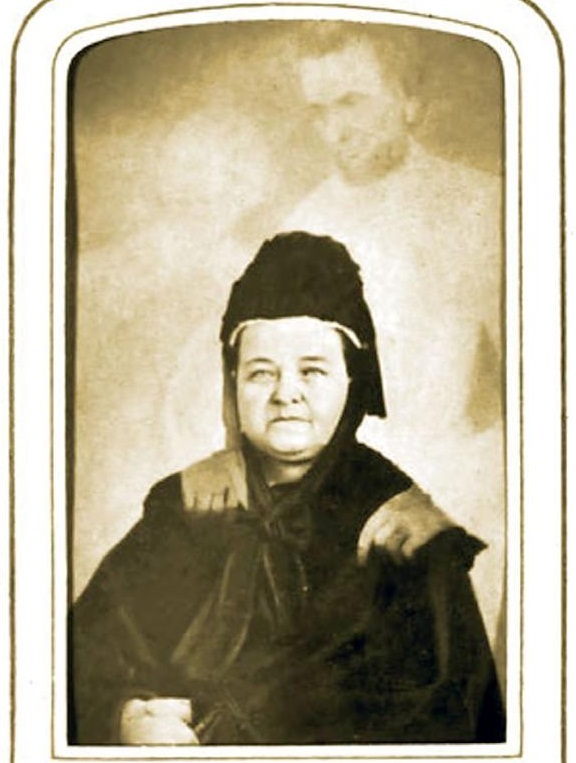 Joining a long list of other Mumler hoax victims, Mary Todd Lincoln visited his studio in the early 1870s to pose for a photo into which Mumler inserted the extremely wispy, bleached image of something looking sort of like her dearly departed husband standing over her with both of his hands lovingly resting upon her shoulders (as well as a less detailed white figure presumably representing her departed son Willie). [vi] Although very touching and reassuring for Mrs. Lincoln — who thought the photo was legitimate because she claimed to have introduced herself to Mr. Mumler under a pseudonym — it still was a fake. 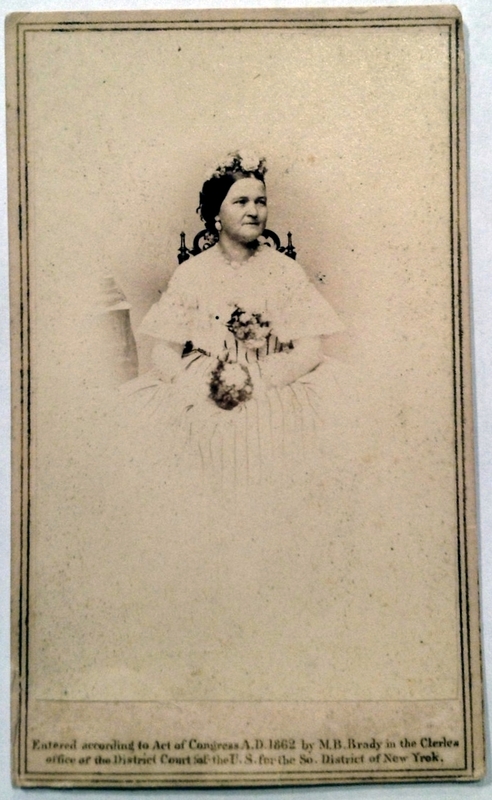 As she mourned for her husband, much of the nation mourned with Mrs. Lincoln by placing her calling card-sized image in their respective family photo albums. 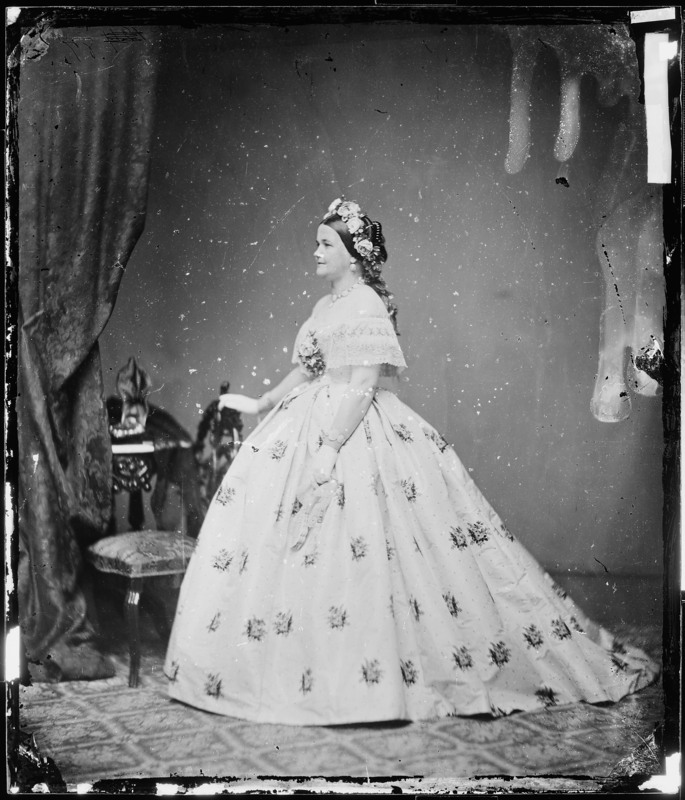 Mary Todd Lincoln would have been immediately recognizable to a then-successful big city photographer like William L. Mumler, even if he had never before met her, simply because he had handled and probably sold dozens upon dozens of pirated prints of her pictures taken in other photography studios, a practice then widespread among many professional photographers. On yet another level, Leibovitz’s photo represents something far more meaningful than just a picture of a 150 year-old glass negative. I suppose that the object Annie Leibovitz photographed can be thought of as Lincoln’s version of the Shroud of Turin. Considering it from that perspective, it might even be viewed as a form of a holy relic. The glass negative images were produced in consequence of Lincoln’s physical presence, during a few moments that particles of light bounced off of him, passed through the camera’s four optical lenses, and interacted with the chemicals on the surface of the exposed glass plate. This, in turn, imprinted his reversed image onto the plate in a negative format. In a sense, Lincoln MADE the images on the glass plate. This photo-chemical process (completed after “developing” and “fixing” chemicals were applied to the plate in a darkroom) rendered the three-dimensional Lincoln as a series of two-dimensional negative images on a thin piece of glass, harkening back to roughly how some people believe a crucified Jesus Christ imprinted an image of himself on his wispy death shroud now said to be in Turin, Italy. Yet another metaphor borrowed from Christianity can be used to describe the inherent spirituality of Anthony Berger’s glass plate negative of Lincoln. In a sense, that object offers its viewers the chance to see a version of Lincoln resurrected from the dead and visually brought back to life into our modern spatial world of three dimensions. To achieve this result, we need only to reverse the process that converted Lincoln’s 3-D physical being into a series of 2-D negative images on a remarkably thin piece of glass. But how? What mad alchemist could possibly achieve this crazy sounding task? Well, here’s how. The images of Lincoln were “branded” onto the glass plate by the photographer’s use of a single camera with at least one row of four side-by-side lenses. The spacing of those lenses more-or-less mimicked the distance between a human’s eyes. Consequently, the viewer can experience a 3-D effect when a set of those image pairs are viewed stereoscopically. Seen in this manner, Lincoln is optically “brought back to life” again in all three of his glorious dimensions. Lloyd Ostendorf, co-author of Lincoln in Photographs: An Album of Every Known Pose, has concluded that Anthony Berger used a multi-lens camera in order to speed up the process of mass producing prints of Lincoln’s image. This means that at least the photographs of Lincoln shot with a multi-lens camera were taken — from Anthony Berger’s perspective — with the primary objective of selling a great number of prints (published by E.& H. T. Anthony & Co.) to the public. An unintended consequence of that business decision by Anthony Berger, however, was to permit future generations the ability to stereoscopically bring Abraham Lincoln “back to life” in 3-D from several moments in time on February 9, 1864. The pose struck by the Great Emancipator was choreographed and captured in a several second exposure as the result of the collaborative efforts of two men — Anthony Berger (the photographer) and Francis B. Carpenter (a painter who arranged for the session with Lincoln and helped orchestrate his poses). Mr. Carpenter convinced Mr. Lincoln to sit for this and twelve other photographic poses despite the President’s great impatience with the long, drawn-out process entailed in posing for what he called “sun pictures.” In fact, so impatient was Lincoln on the day of the February 9, 1864 photo shoot, that when his carriage was delayed, he chose to walk from the White House to Brady’s Pennsylvania Avenue studio and dragged Carpenter along with him. Carpenter quoted Lincoln as saying “I’m pretty much split up for our having had to wait like this.” It is amazing that Lincoln later was able to sit through seven poses at the studio on that day. The collodion process then used in making wet-plate negatives was lengthy and tedious both for photographers and the sitters. Carpenter essentially was an “artist-in-residence” (in the words of Harold Holzer) at the White House for a six month period during the first half of 1864, enjoying what he described as “the freedom of [Lincoln’s] offices at almost all hours.”[ix] His interaction with Lincoln reveals both the special relationship he forged with the President and the great trust Lincoln placed in him. Carpenter obtained this level of intimate access after he pitched the following project to his President — to create a painting of Lincoln and his cabinet members in a scene entitled “The First Reading of the Emancipation Proclamation Before the Cabinet.” Carpenter’s goal was to memorialize as historically accurately as possible what he considered to be one of the greatest moments in the history of mankind. 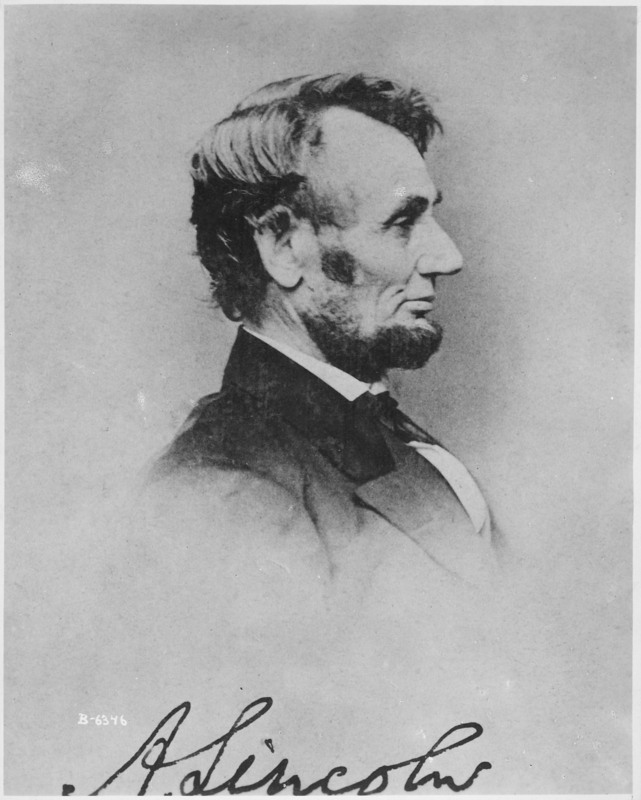 As far as Francis Bicknell Carpenter must have been concerned, the photos of Lincoln which he arranged for Anthony Berger to shoot were to serve a singular purpose — to provide him with positive prints of Lincoln in poses desired for use as figure studies for The First Reading of the Emancipation Proclamation Before the Cabinet. Any other poses struck by Lincoln and photographed by Berger, such as his “quiet family moment” view of Tad Lincoln standing next to his father while both stared at a photo album prop, would have been shot on Berger’s own initiative as they had absolutely no relevance to Carpenter’s painting of the The First Reading of the Emancipation Proclamation Before the Cabinet. Granted, Carpenter later used that father-son photo as the very rough basis for two separate paintings (on a much, much smaller physical scale) titled “President Abraham Lincoln and Tad,”[x] which is part of the White House collection, and “The Lincoln Family,” at The New York Historical Society; but they and other similar paintings were afterthoughts and sidelights to his main objective. From the beginning, he envisioned that his Emancipation painting would be mass-produced in the form of engravings for all to see and enjoy, making his work well known, immensely popular, and a key part of America’s cherished historical record. All of this points to the conclusion that Carpenter chose Berger to work exclusively on this several month long project and that he did so both because of their familiarity with one another and his admiration for Berger’s talents. If Francis Carpenter had preferred a man from one of the other highly-regarded studios in D.C. (such as Wenderoth & Taylor, at which Lincoln was photographed sometime in 1864, for example) or even a different Brady cameraman, he surely would have brought in someone other than Anthony Berger to help him with what he thought would become his greatest masterpiece and elevate him to the status of the exalted Gilbert Stuart or John Trumbull who famously painted George Washington. This conclusion ignores one point — that we only definitively know of a handful of the photos which were taken by Anthony Berger when he worked for Brady. In each such instance, that knowledge comes entirely from Carpenter’s published and unpublished writings. All of Berger’s known photographs involved Carpenter’s collaboration, perhaps with the exception of the supremely compelling photo that Berger took of Lincoln with his youngest son Tad. Thus, we don’t have a body of Berger’s work independent of Carpenter against which to compare. Granted, Carpenter “did have a keen eye for portraiture and documentary groupings,” but who is to say that Anthony Berger never took any other portrait photos without Carpenter’s involvement of equal or greater artistic merit? The Anthony Berger photographs, in the words of David Hackett Fisher, showed Lincoln “as a wise and experienced leader, with an aura of growing strength and confidence.”[xvi] Should that achievement be attributed solely to Carpenter, despite the fact that “there were doubts about Carpenter’s reputation even in his own day” and one modern art historian unfairly characterized him as a “very boring” artist? Or is it more likely that the combined talents of Carpenter and Berger produced photographs of Lincoln beyond either of their individual powers? Besides creating memorable photographs “branded” onto photographic film, Annie Leibovitz has excelled at other forms of branding — in particular, linking the names of celebrities to her widely-recognized photographs of them. To think of a celebrity and then immediately conjure up in one’s mind their image from a Leibovitz photograph is a supreme achievement. Declares Sarah Boxer, “she is a genius at it.” By so succeeding, Leibovitz also has created her own brand. The original concept of creating compelling photographic images of celebrities was most successfully executed in America first and foremost by the man who employed Anthony Berger for approximately a decade — Mathew Brady. It was Brady who created the widely recognized “Brady of Broadway,” “Brady’s National Photographic Portrait Gallery,” and “Photograph by Brady” brands. The celebrities photographed in Brady’s studios included Presidents, members of royalty, noted politicians, philosophers, religious figures, ambassadors, high-ranking military officers and heroes, actors, and even members of P.T. Barnum’s circus. These photographs of stars made Mathew Brady, in kind, a veritable rock star in his day. Few knew and hob-knobbed with as many of the rich and famous as Mathew Brady. Now, exactly 170 years after Brady opened his first studio, there are not many photographers as successful in the pursuit of ever-lasting images of celebrities as Ms. Leibovitz. At some point in her career of creating the equivalent of trademark images of stars, Annie Leibovitz has become her own brand just as Brady once did. In the same way that Annie Leibovitz has proven herself a modern artistic genius by imprinting in our minds immediately recognizable photographs of celebrities — such as John Lennon naked and curled around Yoko Ono, Dolly Parton paired with Arnold Schwarzenegger, Dan Akyroyd and John Belushi as the “Blues Brothers,” Bruce Springsteen’s “Born in the U.S.A.,” Demi Moore naked and pregnant, etc. — with “the props, the settings, the clothes, and even the gestures and expressions that will cling to each person’s image … linking one to the another,”[xvii] so too were Anthony Berger and Francis B. Carpenter geniuses. Their collaboration, which resulted in thirteen known poses of Lincoln, produced several which are immediately recognizable and considered iconic a full century and a half later. Yet, because those photos were linked for the better part of the last 150 years only to Mathew Brady, any fame and notoriety due to Messrs. Berger & Carpenter has gone largely missing. Their story would have a modern-day parallel if, for example, it were to be demonstrated conclusively that the crème de la crème of Annie Leibovitz’s most iconic photographs over the last several decades were not taken by her, but by an obscure younger protégé in her employ essentially unknown to the art world [Note: this is nothing more than a hypothetical used for illustrative purposes]. Boxer then rhetorically asks “when you hear the name Annie Leibovitz, what images spring to mind?” Answering her own question, she listed several easily recollected celebrity photos by Leibovitz. But Boxer also posits that as a result of Leibovitz’s photo of Anthony Berger’s multi-lens glass plate negative of Lincoln appearing at pp. 89-90 in Pilgrimage, “maybe the dust of Abraham Lincoln” should be added to that list. Ms. Leibovitz’s picture of Anthony Berger’s photographic negative gives me hope that the time finally has come, 150 years after the fact, for us to collectively tip our hats in recognition of the brilliance of Anthony Berger and Francis B. Carpenter for so artfully collecting “the dust” of Lincoln on several glass plates. I encourage anyone intrigued by these sentiments to make their own pilgrimage to Anthony Berger’s Lincoln images by viewing them online in high resolution at the National Archives and the Library of Congress. See, e.g., http://www.loc.gov/pictures/search/?q=lincoln%20anthony%20berger. I also highly recommend Ms. Leibovitz’s book Pilgrimage and the current and future exhibitions associated with that book. Read how one man’s “stuff” left sitting untouched in a room for nearly a century presents us with a real time capsule looking back to a life sacrificed in World War I and how things once were. [i] Boxer, Sarah, “Annie Leibovitz’s Ghosts,” The New Yorker, March 19, 2012. [ii] Browning, Dominque, “A Pilgrim’s Progress,” The New York Times, October 30, 2011. [iii] “Brady had a special process for copying glass or collodion negatives so that the duplicate plate could not be distinguished from the original.” Ostendorf, Lloyd and Hamilton, Charles, Lincoln in Photographs: An Album of Every Known Pose (1963), at p. 165. [iv] To view Leibovitz’s photo of the plate in Pilgimage, see: http://www.brainpickings.org/index.php/2011/11/08/pilgrimage-annie-leibovitz/; or http://books.google.com/books?id=xwsLIRIHDj0C&q=berger#v=snippet&q=berger&f=false; or http://victoriacullen.typepad.com/queenwithoutacountry/page/2/. [vi] “The Ghost and Mr. Mumler,” American History Magazine, February 8, 2008. http://www.historynet.com/the-ghost-and-mr-mumler.htm; Moye, David, “William H. Mumler, Spirit Photographs, Amazed Audiences with Ghostly Images,” The Huffington Post, August 22, 2013. http://www.huffingtonpost.com/2013/08/22/spirit-photographs-_n_3795717.html. [vii] To see some of her photographs, visit http://rogerjnorton.com/photos/marytoddgallery.html. [ix] Holzer, Harold, Borritt, Gabor S., and Neely, Mark E., “Francis Bicknell Carpenter (1830-1900): Painter of Abraham Lincoln and His Circle,” American Art Journal, at p. 87, fn 2, quoting Carpenter, Francis B., “Personal Impressions of Mr. Lincoln,” New York Independent, April 27, 1865, p. 1. [x] An image of the painting can be seen at Holzer, Harold, Borritt, Gabor S., and Neely, Mark E., “Francis Bicknell Carpenter (1830-1900): Painter of Abraham Lincoln and His Circle,” American Art Journal, at p. 87. Interestingly, the relative positioning of Lincoln and Tad was swapped in this and Carpenter’s other painting, as if the underlying photograph was horizontally flipped. The part in Lincoln’s hair in the painting, on the left side of his head, is different than the way it is depicted in all of his February 9, 1864 photos, on the right side of his head. This was an anomaly, in that Lincoln’s part otherwise is on the left side of his head in all other photographs. Carpenter wrote on the back of a cabinet-sized print of the Berger photograph used as the basis for the old U.S. $5 bill: ‘From a negative made in 1864, by A. Berger, partner of M.B. Brady, at Brady Gallery …. [Lincoln’s] barber by mistake this day [February 9, 1864] for some unaccountable reason, parted his hair on the President’s right side, instead of his left.” Ostendorf, Lloyd and Hamilton, Charles, Lincoln in Photographs: An Album of Every Known Pose (1963), at p. 177. This language also was quoted by Carpenter’s grandson and then owner of the cabinet card sized print, Emerson Carpenter Ives, in a letter to the editor, published in Life Magazine, March 7, 1955. [xi] http://peerintothepast.tumblr.com/post/65008148133/abraham-lincoln-by-smithsonian-institution-on. Ostendorf, Lloyd and Hamilton, Charles, Lincoln in Photographs: An Album of Every Known Pose (1963), at pp. 128-129. [xii] Carpenter wrote in his diary on February 23, 1864, “Found that Berger at Brady’s had made a picture of Mr. Stanton in the position I told him to put him in …” Ostendorf, Lloyd and Hamilton, Charles, Lincoln in Photographs: An Album of Every Known Pose (1963), at p. 186. In Diary of Gideon Welles: Secretary of the Navy Under Lincoln and Johnson, Volume I (1911), at p. 527, Welles writes that on February 17, 1864 he went to Brady’s studio “with Mr. Carpenter, an artist, to have a photograph taken. Mr. C. is to paint an historical picture of the President and Cabinet at the reading of the Emancipation Proclamation.” Although no mention was made of whether Berger was the photographer, it is likely that he was. [xiii] To see the sketch of Stanton which Francis B. Carpenter presumably completed from Berger’s photograph, as well as several other figure studies sketched by Carpenter of Lincoln’s cabinet members, see Holzer, Harold, Borritt, Gabor S., and Neely, Mark E., “Francis Bicknell Carpenter (1830-1900): Painter of Abraham Lincoln and His Circle,” American Art Journal, at pp. 72-73. [xiv] Holzer, Harold, Borritt, Gabor S., and Neely, Mark E., “Francis Bicknell Carpenter (1830-1900): Painter of Abraham Lincoln and His Circle,” American Art Journal, at p. 67. [xvi] Fisher, David H., Liberty and Freedom: A Visual History of America’s Founding Ideas (2004), at p. 347. [xvii] Boxer, Sarah, “Annie Leibovitz’s Ghosts,” The New Yorker, March 19, 2012. [xviii] Sullivan, George, Picturing Lincoln: Famous Photographs that Popularized the President (2000), at p. 82.